Braces can change a person's life — not just their appearance but their dental health as well. To be honest, though, wearing braces are, well, kind of a drag — especially for teenagers. Braces can be restrictive and confining; you'll also have to give up certain favorite foods for a while. But more than any of that, they're just plain unattractive. Even being able to choose colors for the brackets and elastic bands can't fully ease a teenager's embarrassment when they smile. There is, however, an alternative to braces: clear aligners. And they could make orthodontic treatment during this difficult phase of their life much easier to handle. 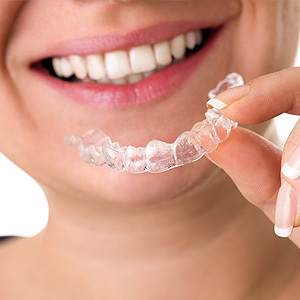 Clear aligners are a set of clear plastic trays that can be taken in and out of the mouth. Each of the custom-designed trays is slightly smaller than the previous one in the series. After wearing the first tray for a couple of weeks (at least 20 to 22 hours a day), the patient switches to the next tray in the series. They repeat this process until they've worn all the trays. The gradual change from tray to tray moves the teeth to the desired position. Clear aligners have some distinct advantages over braces, especially for younger patients. They can be removed for cleaning or for a rare special event. They don't limit movement as much as braces. And, they're nearly invisible — other people may not even notice them. And newer aligners are now designed with tiny “power ridges” that increase their movement capabilities. This has made them more useful for teenagers with complicated bite problems and other issues. There are cases, though, where braces may be the better choice: where you need more control over tooth movement or the patient needs jaw surgery to achieve proper tooth alignment. And their removability could be an issue if the patient won't leave them in their mouth for the necessary time each day. To find out if clear aligners might be a viable option for your teenager, visit us for a complete orthodontic examination. We can then discuss your best option — clear aligners or braces — to achieve the most desirable outcome for your teenager. What Is Contouring and Reshaping? What Is Dental Implant Restoration? What Type of Dental Filling Should I Choose? How to Maintain My Teeth Whitening Results?